Allentown, Pennsylvania opened up their very first medical marijuana dispensary—Mission Dispensary—on June 12, 2018. 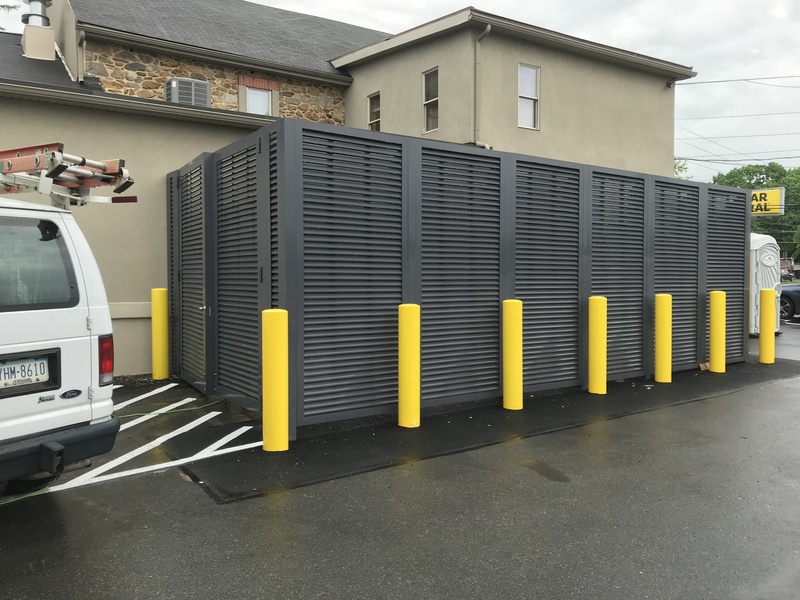 PalmSHIELD had the great honor of having one of our horizontal louver mechanical screening enclosures installed at their dispensary. 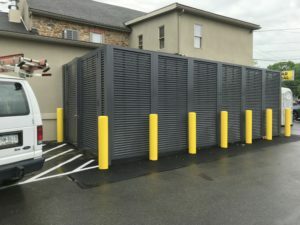 PalmSHIELD’s horizontal louver fence system was installed impressively by ProMax Fence Systems. The mechanical equipment screening fits in very nicely with the exterior of the building by complementing its unique architectural design and color accents. The enclosure is off to one side of the building and is facing toward the front. This PalmSHIELD project used an exclusive internal locking device and Gorilla hinges. The enclosure is 10-feet tall with a large double swing gate at the back of the structure. Due to the gate’s size, it needs robust hinges. The Gorilla hinges utilize a butterfly design and half inch mounting plate with all the bolt holes tapped and pre-drilled. Based in Reading, Pennsylvania, ProMax Fence Systems has become a PalmSHIELD installation expert. They have installed PalmSHIELD product on many occasions and after seeing Mission Dispensary’s finished product, it is obvious that they do superb work. All the seams of Mission Dispensary’s system are tight and it continues to stay level and even as the ground begins to slope. Congratulations to ProMax Fence Systems for another outstanding PalmSHIELD horizontal louver enclosure installation! PalmSHIELD is the country’s leader in mechanical equipment enclosures, walls and screening with the industry’s largest louver and fully-framed, one-of-a-kind panel designs. They are also proud to offer self-standing and rooftop system solutions. Every screen project is a custom project. To see the wide variety of screening options PalmSHIELD offers or if you have any questions please visit PalmSHIELD today.